PCPCC hosted its Annual Conference on November 8, 2018. 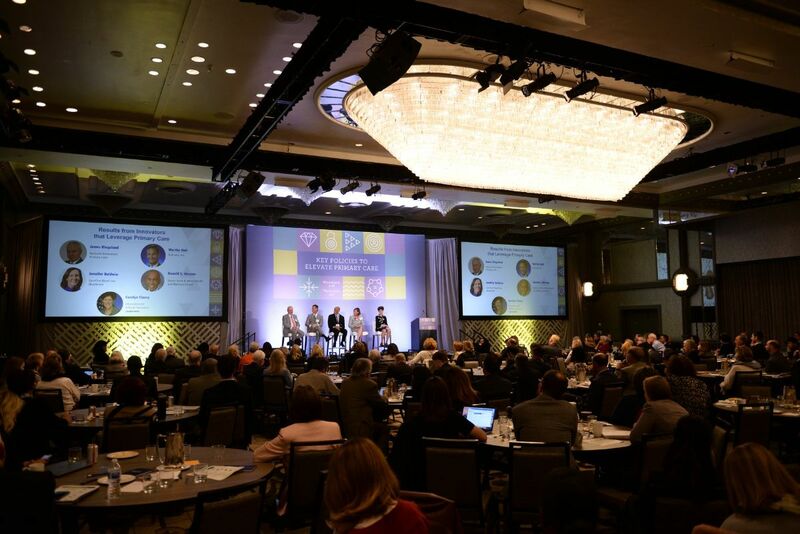 This year’s conference addressed various public and private policies aimed at advancing primary care as envisioned by the Shared Principles. The policies we highlighted include state legislation and regulations that are intended to compel additional investment in advanced primary care models; employer innovations that better enable primary care; and the inclusion of patient/family needs and preferences in the re-design of primary care. The conference included a mixture of keynotes, panel discussions, and interactive work. During the Open Space session, attendees worked in small groups to brainstorm ideas to transform primary care. This interactive session gave participants a chance to share their own perspective and gain insights from a diverse group of contributors. The outcome of this session provided strategies and ideas for attendees to take back to their organizations and continue to improve the primary care system. 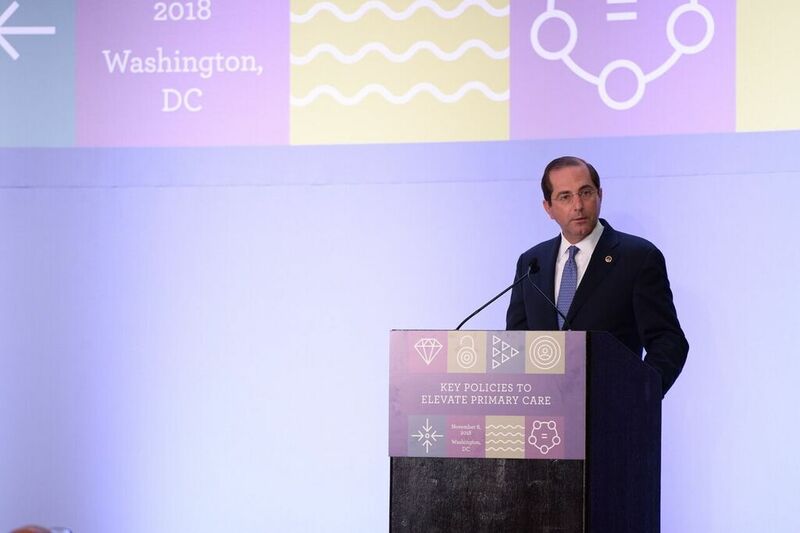 PCPCC was fortunate to have HHS Secretary, Alex Azar, as the Annual Conference’s keynote speaker. He announced that the department was moving rapidly toward value, including mandating bundled payments. You can view Secretary Azar’s full remarks here. Please mark your calendars for next year's conference on November 4-5, 2019. 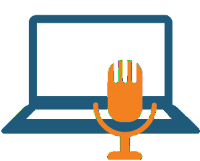 PCPCC will host a webinar today, Health Care Without Walls: Implications for Primary Care. This webinar will focus on advancing a more technology-enabled health care system through regulatory, payment, workforce and human factor changes – as outlined in the recent Health Care Without Walls: A Roadmap for Reinventing U.S. Health Care report. Susan Dentzer, President and Chief Executive Officer of the Network for Excellence in Health Innovation, will present the roadmap. Two key contributors to the report, Dr. Sunny Ramchandani, Deputy Chief Medical Officer of Aetna, and Dr. John Bulger, Chief Medical Officer of Geisinger Health Plan, will discuss implications for primary care. Suzanne Delbanco, Executive Director of the Catalyst for Payment Reform, spoke with Ann Greiner, President and CEO of the PCPCC, to discuss the patient centered medical home (PCMH) model. Ann shares the origin of the PCMH, how the concept and use has evolved over time, how the PCMH can influence health care delivery, and the evaluation of the performance of PCMHs. Listen to this important conversation on the Catalyst for Payment Reform's website. The Barbara Starfield Awards Dinner took place on the evening of the PCPCC Annual Conference, at which the Barbara Starfield Award, the Primary Care Community Leadership/Research Award, and the Advanced Primary Care Practice Award were presented. AppleCare Medical Group, part of OptumCare, received the Advanced Primary Care Practice Award, recognizing the organization’s commitment to team-based care, with a focus on care transition services for post-discharge visits through the use of “patient coaches.” Dr. Scharmaine Lawson, CEO of Advanced Clinical Consultants, received the Primary Care Community/Research Leadership Award for her inspiring work as a nurse practitioner in New Orleans, Louisiana. Dr. Lawson started the first nurse practitioner-owned house-call practice in Louisiana in order to improve access to primary care. We played a moving video showing Dr. Lawson at work in her community before she accepted the award. Finally, Dr. Karen DeSalvo, MD, MPH, received the Barbara Starfield Primary Care Leadership Award. During her career, Dr. DeSalvo has worked tirelessly to transform healthcare delivery through technology, medical education, and community building. 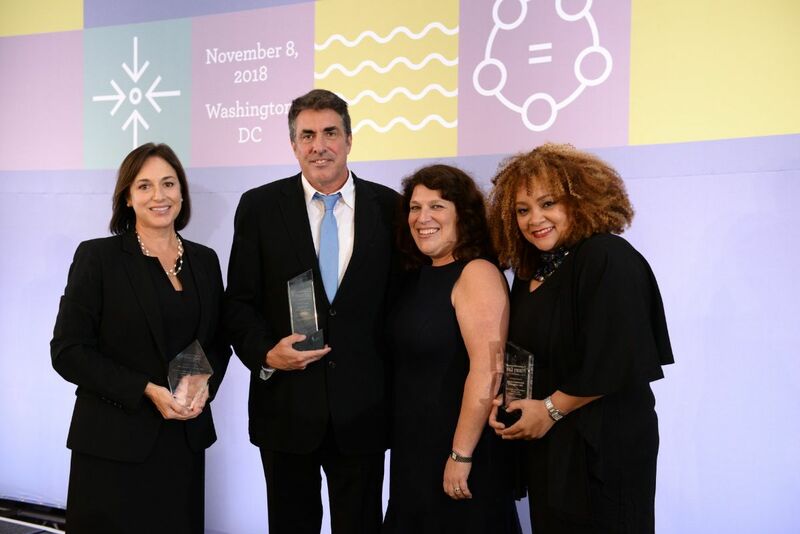 Dr. DeSalvo earned this prestigious award because of her dedication to improving primary care access in order to reduce inequities and improve health. You can view photos from the awards dinner on our Facebook page. PCPCC convened Executive Members and key thought leaders from 25 states to discuss strategies to increase investment in primary care. The 120 meeting participants were guided by PCPCC’s board-approved Consensus Recommendations on Primary Care Investment.The goal of the workshop was to increase visibility and build the case for increasing primary care investment in states and nationally, with the goal of improving health care quality, patient experience, and affordability. Participants worked in small groups to identify additional states that could advance the primary care investment mantle. Leaders from six new states and three existing states developed “action plans” to drive investment. PCPCC will continue facilitating this conversation among interested stakeholders and will promote their progress as a catalyst for others to consider action. Ann Greiner, President & CEO of the PCPCC, gave a presentation at the Society of Teachers of Family Medicine conference in Tampa, Florida on primary care investment, highlighting successes from key states. The presentation made clear that there is a fundamental disconnect between the importance of primary care to our healthcare system and the value we attribute to it. The U.S. only spends about 5-7% of their healthcare budget on primary care services, and this spending is declining. This lack of investment is especially jarring compared to primary care spending across the European Union, which averages 12%. Therefore, PCPCC’s goal is to increase primary care investment through alternative payment models, including the patient-centered medical home. PCPCC’s recommendations for increasing primary care investment include defining standardized measures, engaging broad stakeholders, setting clear goals to achieve the quadruple aim, aligning payment models and utilizing incentives, and evaluating outcomes through evidence-based assessment. Several key states that are successfully increasing investment in primary care were highlighted, including Rhode Island—which increased primary care spending from 5.7% to 9.1% over four years while reducing costs by 14%—and Oregon—which legislatively mandated 12% spending on primary care in 2017. Several other states have enacted or proposed similar legislation. Next steps include baseline and ongoing measurement, raising visibility of the issue, defining multi-stakeholder leadership, and evidence dissemination. On December 13th, 2018, PCPCC hosted the second meeting of its Behavioral Health Integration Workgroup during which members focused on assessing how behavioral health is managed for a person in their entirety. Members discussed a number of challenges facing behavior health, including primary care integration, payment, stigma, and access. Members are planning several projects to accelerate and support behavioral health integration and will meet regularly in 2019. PCPCC members should contact Chris Adamec ([email protected]) if they are interested in participating. This past November, PCPCC worked to support the passage of several priorities before the end of the 115th Congress. PCPCC encouraged the Senate to act to preserve and expand access to high-value preventative care for consumers with high-deductible healthcare plans (HDHP). PCPCC is concerned that, despite increasing access to health insurance, more consumers are skipping high-value preventative primary care – most likely due to out of pocket costs associated with high deductibles in these plans. PCPCC also advocated for passage of the Comprehensive Care for Seniors Act of 2018 (S.3338) expanding access to Programs of All-Inclusive Care for the Elderly (PACE) because these programs exemplify many of the goals found in our Shared Principles of Primary Care – namely an emphasis on high-value care primary care that is coordinated, integrated, team-based, and incorporates patient and family caregivers. In October, PCPCC commented on the CMS Medicare Shared Savings Program's (MSSP) "Pathways to Success" proposed rule. PCPCC applauded changes to strengthen the program — particularly for lower revenue, often clinician-led Accountable Care Organizations (ACOs). However, PCPCC is concerned by estimates that show far fewer organizations would choose to join or remain in the MSSP program. PCPCC encourages CMS to balance its effort to incentivize ACOs to move quickly to risk, with the need to maintain a healthy pool of ACOs moving along the risk continuum. In addition, PCPCC joined several other groups in providing recommendations to CMS on how ACOs participating in the Medicare Shared Savings Program (MSSP) can better address mental health, addiction, and suicide in the individuals they serve. Key recommendations included promoting behavioral health capacity in ACOs, expanding patient-reported outcomes in mental health and substance use, and offering additional outcome-based payments in behavioral health. 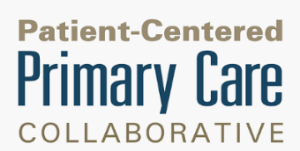 Finally, PCPCC created a new web page on primary care investment, which includes fact sheets, research, and consensus recommendations on primary care investment. PCPCC invites our readers to complete a survey so that we may better understand your preferences for receiving results of patient-centered outcomes research. We are hoping to identify the diverse needs and preferences of PCPCC’s stakeholders in connection with a project funded by the Patient Centered Outcomes Research Institute (PCORI). We greatly appreciate your help in completing the following survey and will plan to share the survey results within the next few months.